The Apprentice feature is part of some of our themes and it is designed to help you create high-quality course and membership content. Note that Apprentice is not a membership pluign or feature. There are many plugins available that let you ​protect certain parts of your website, make them only accessible to members and charge money for the membership (e.g. S2Member, Paid Memberships Pro, MemberMouse, WishList Member and many others). 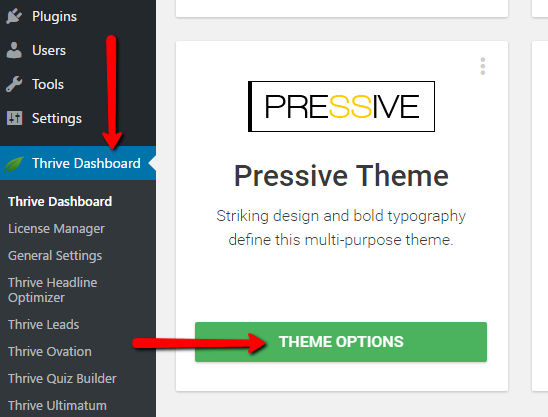 Click on the "Enable" button (2) to activate the feature within the theme. You can create a structured course using Apprentice Lessons and pages that aren't part of a course using Apprentice Pages. Read more about the difference between the two here. ​On the left, you can use a drag-and-drop interface to re-arrange your lessons and categories (1). This area will be empty, to begin with. You can add new categories directly from the interface (2). Note that only the category name is required, but you can also add a description text and you can define the "slug", which determines how the category URL will be displayed. A structure with 1 level consists of modules and lessons (each module has multiple lessons). A structure with 2 levels consists of chapters, modules and lessons. Each chapter has multiple modules, each module has multiple lessons. A structure with 3 levels consists of products, chapters, modules and lessons (each product contains multiple chapters etc.). Finally, you'll see a list of your lessons (4) that aren't assigned to categories yet. From the list, you can drag them into the lessons structure. ​Consider how many levels you want to have in your lesson structure and create the categories for them. This way, you can create a rough draft of what your product will look like. Think of it like writing an outline of your table of contents first, before filling out the whole book with text. Go to "Apprentice Lessons" and click on "Add New" to create a new lesson. You'll see an editor that is very similar to the post editor, with many of the same options. 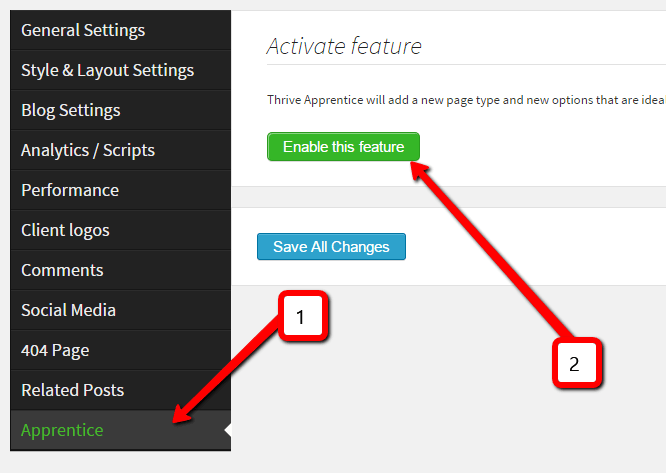 An Apprentice Lesson is simply the way you deliver your content in the Apprentice feature. 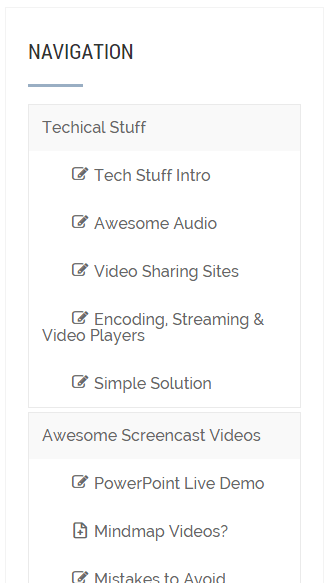 In the lesson options, you can also set a "Lesson Type" such as audio lesson or video lesson. This allows you to create a multi-media course. The way the different lesson types work is similar to the blog post formats supported in some of our themes. 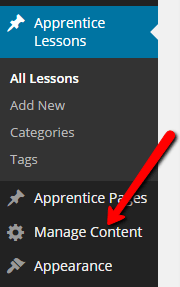 When you create Apprentice lessons, you can either assign them to a category you've already set up, in the post editor, or you can later assign them by going back to the content manager. ​Apart from Apprentice Lessons, you can also create Apprentice Pages. Apprentice Pages are meant for any kind of content that isn't part of the lesson structure. A perfect example is a member homepage or a welcome page. The "Welcome Back" short code is perfect for a member homepage. With it, you can create a nice, large call to action that will encourage first time visitors to start with the first lesson (it will automatically link to the first lesson in your lesson structure). For members who've looked through part of the lessons and come back later, the Welcome Back short code will link to the last place where they left off. ​A feature that really makes Apprentice come together is the Lessons Navigation Widget. Go to "Appearance" and "Widgets" to find the new widget and new widget areas available. You'll see new widget areas for Apprentice (2). 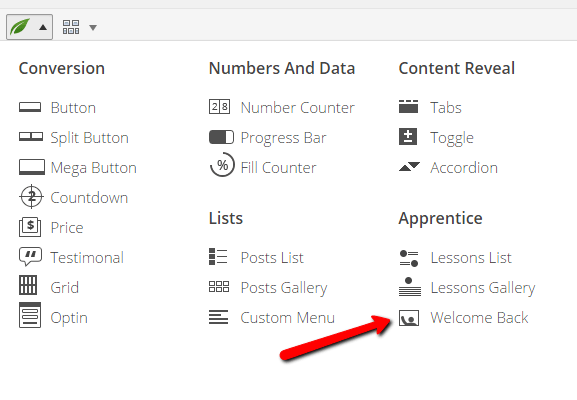 This means you can show completely different widget content on Apprentice pages and lessons, than elsewhere on your site. 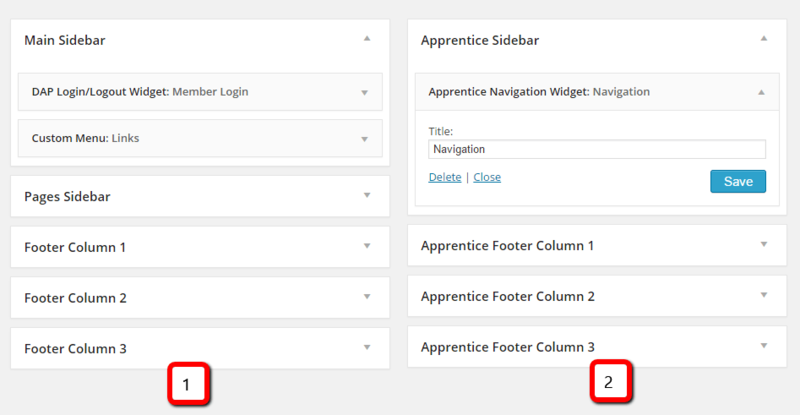 The navigation widget automatically creates a full overview over your Apprentice Lessons, including the structure and order that you've set in the Content Manager.